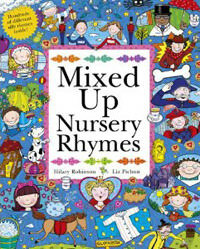 First came Hilary’s phenomenal bestselling Mixed Up Fairy Tales with sales of over 100,000 copies to date, and now comes Mixed Up Nursery Rhymes! Illustrated by Liz Pichon, the creator of the bestselling fiction series, The Brilliant World of Tom Gates this ingenious split-page book lets you create your own hilarious versions of many much-loved rhymes. Published by Hodder Children’s Book, January 2013. Hilary will be joined by international representatives of The Children’s University at the Annual Conference at Shrigley Hall Hotel, Macclesfield on the 8th and 9th December. The Children’s University aims to promote social mobility by providing high quality, exciting and innovative learning activities and experiences for children outside normal school hours. Christmas Surprise: Out October 3! 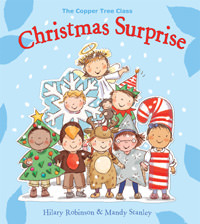 Christmas Surprise is the second book in the Copper Tree Class series and celebrates the relationships between the young and the old. When the children help the elderly people at their local care home get ready for Christmas they have fun thinking of ways to make the residents’ Christmas special. The children delight in finding out about their lives and also those of the three pets, Bobby and Bess, two retired huskies and Bonnie, a retired guide dog and, as always at Christmas, there are a lot of surprises. Hilary will be taking part in the Manx Literary Festival, Isle of Man. The festival takes place between 27th and 30th of September 2012 and brings together the fine literary talent from around the British Isles. 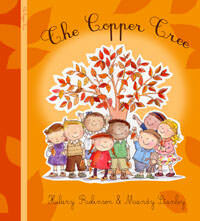 Weeks after the sale of foreign rights to Nanmee books in Thailand, rights for The Copper Tree have also now been sold to Wisdom Garden, South Korea by Morag O’Brien at Ed Victor. Hilary will be taking part in The Sunday Times Festival of Education Conference at Wellington College on the 24th of June. She will be representing The Children’s University. 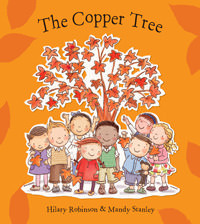 Hilary was interviewed about The Copper Tree on Look North, the BBC regional news programme for Yorkshire. Foreign rights for The Copper Tree have been sold to Nanmee Books in Thailand by Morag O’Brien at Ed Victor Ltd.
You Magazine from the Daily Mail featured The Copper Tree as their Book of the Week. New Book! Published 3rd April 2012 (release date brought forward due to advance orders). When Olivia’s teacher, Miss Evans, dies, the children at her school are encouraged to think of everything that reminds them of her. Written with touching sensitivity and sprinkled with light hearted moments, ‘The Copper Tree’ is about love and legacy and will help children understand that while sadness is an inevitable part of grief, death is not necessarily the end… for what is left behind can be everlasting. A great book for young children facing bereavement.